Carol Jarecki awards Joel Johnson his first place plaque at the U.S. Senior. Photo Charles Hatherill. Joel Johnson remembers the days when he was playing in the first World Open and playing Carol Jarecki's son. He told International Arbiter Carol, who was the tournament director at the U.S. Senior how her son could not settle down or fidgeted at the board and when undefeated at the tournament. 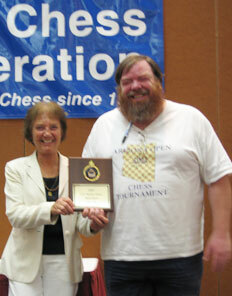 This is Joel's first US Senior and was happy to win the tournament with a possible birth in the US Closed next year. He said the tournament was great and in a nice relaxed atmosphere. He is looking forward to playing in future US Seniors. This year's U.S. Senior Open was a good excuse for a family vacation. Participant Theodore Bullocks with his grandson and daughter. Visit the official web site of the 2007 U.S. Senior Open.